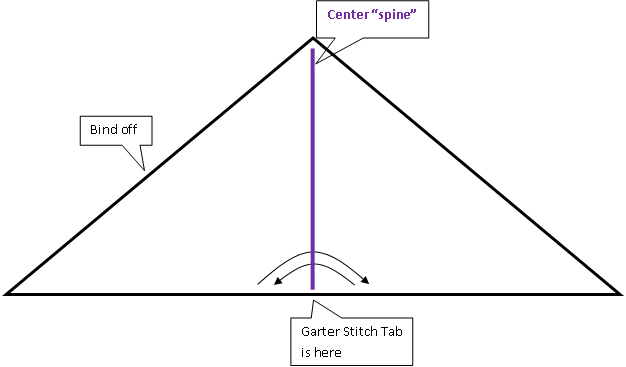 What’s a garter stitch tab? Its that particular way of starting a triangular shawl. You begin with a tiny, really quite tiny, garter tab. Then you knit along the side of that tiny tab which squishes it out of shape. And this tab serves as the foundation for your triangular shawl. By triangular shawl, I mean those that start at the neck and work their way out and down with each row. Zetor uses this type of construction (and its a free pattern so feel free to grab yourself a copy!). If your looking for something in a thicker yarn, there is Coral Cove (also a freebie which you can get a copy of right here). Personally I start on DPNs and then knit on to my long shawl needle with “row 1”. I find it less fiddly and easier to manage that way. But however you get it done, that garter stitch is quickly made and you’ll be on your way to making triangular shawls in no time. Like free tutorials? Me too. I post one (nearly) every Sunday and they cover knitting, crochet, and handspinning stuff. You can find them all right here. 5 Comments on "Two Ways to Knit a Garter Stitch Tab"
I like the dpn start too. It is essentially the same but with DPNs I have less fussing around. So glad it helped! It is a wee bit of an esoteric topic I know. But I’ve had many a student pass up a pattern they wanted to try because the garter stitch tab intimated them. As for finding a way to make lace concentration free… I I could do that I’d be a genius. Thanks for showing us how to do that . I love the shawls you have listed as well. Thanks! You needed an new project didn’t ya? We all do.